We review and summarize commonly used techniques for breast cancer treatment, both in patients with conserved breasts, as well as in patients post-mastectomy. We extend our discussion to the use of Virtual, Simulation and three-dimensional (3-D) treatment planning in the treatment of breast cancer, and describe the benefits and advantages of this approach. 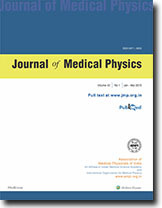 Accurate determination of Zero-Area Tissue-Maxmimum Ratio (TMR) is a pre-requisite for using Scatter-Function dose computation model for estimating the dose in a phantom irradiated by photon beams. In the current study, zero-area TMRs have been experimentally determined by measuring the narrow beam attenuation curve in scatter free conditions for 60co, 6, and 10 MV photon beams. The measured zero-area TMR values were cross-verified by two independent procedures and were found to be in good agreement. These measurements along with the conventional measurements of TMRs allow an accurate determination of SMR values. In the present study, the virtual point source positions were determined for field sizes defined by standard electron cones and cerroband field inserts for various electron energies. Ionometric measurements were carried out with a0.6 cm3 Farmer type ion chamber at dm= in a polystyrene phantoms. The virtual source positions obtained by inverse square law method were observed to change with the beam energies and the applicator sizes. It was also observed that the Virtual Source-to-Surface Distances O/SSD) are greater for the field sizes defined by the cerroband inserts in the standard 20 cm x 20 cm applicator for all energies. These observed variations in virtual source positions are due to the change in electron scatter for different energies and beam sizes. When the cerroband cut-outs are introduced close to the chamber, the scattering conditions are likely to get altered, resulting in change in the virtual source position. As electron beam with low monitor unit (LMU) settings are used in some dosimetric studies, better understanding of accuracy in dose delivery at LMU setting is necessary. The dose measurements were carried out with 0.6-cm3 Farmer type ion chamber atda max a polystyrene phantom. Measurements at different MUs show that the Dose Linearity Ratio (DLR) increases as the MU setting decreases below 20 MU and DLRs are found to increase when the incident electron beams have higher energies. The increase in DLR is minimum for low dose rate setting for all five electron beam energies (6, 9, 12, 16 and 20 MeV). As the variation in dose delivery is machine-specific, a detailed study should be conducted before the low MU setting is implemented. Since errors in dose delivery are high at higher dose rates, low dose rate may be better at low MU unit setting. Gafchromic MD-55 is a colourless, grainless and transparent thin film dosimeter which develops a blue colour after exposure to radiation without any physical, chemical or thermal processing. The colour intensity is a function of radiation exposure. Dosimetric characteristics such as sensitivity, linearity, uniformity, reproducibility and post irradiation stability of the film response were studied experimentally simulating the condition of radiotherapy dosimetry. The irradiation of film samples, each of size 1.5 cm x 1.5 cm, were carried out in a full scattering medium, Mix-D phantom, under a telecobalt beam. The pre-irradiation and post-irradiation optical densities (OD) of these film samples along directions parallel and perpendicular to media's coated direction were determined with the help of a scanning spectrophotometer using the light of wavelength 676 nm and slit width 0.5 nm. The uniformity of irradiated film samples along these two directions of the film was found to be within 4% and 8%, respectively. The variation of net mean oiptical density (NMOD) with radiation absorbed dose (D) was found to be linear in the dose range studied in this investigation and can be represented by the equation NMOD - 0.02268 + 0.05342 x D. The average rate of increase of OD of irradiated samples, 24 hours after iradiation, was observed to be 1.5% per week, and was independent of radiation absorbed dose. These results indicate that the film is suitable for absolute as well as relative dosimetry of radiation beams commonly encountered in radiotherapy treatment, provided the scanning of the film samples are done in a direction parallel to media's coated direction .